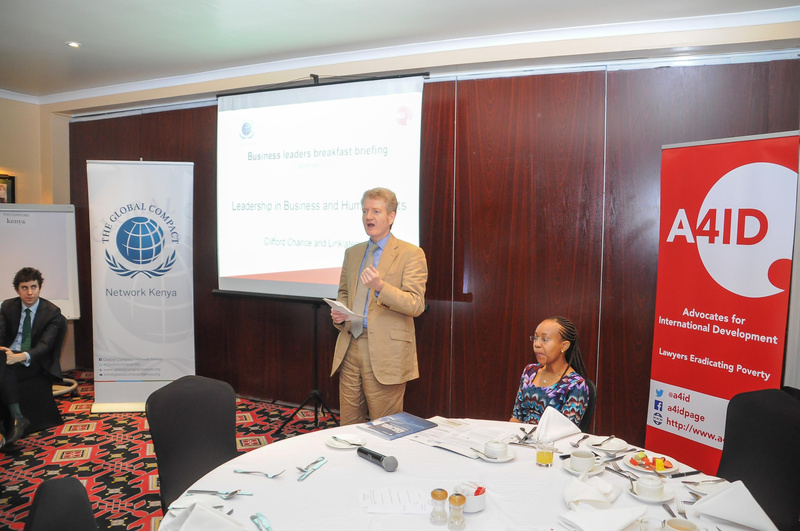 Friday 1 December, 2017: Global Compact Network Kenya in collaboration with Advocates for International Development (A4id) hosted a Business Leaders Breakfast Briefing on "Leadership in Business and Human Rights" The meeting convened thirty-five business leaders from diverse sectors to discuss developments in corporate approaches to advancing responsible business practices. Opening the forum, Global Compact Kenya Country Coordinator Ms. Judy Njino drew participants attention to the first two Principles of the UN Global Compact which calls on business to support and respect the protection of human rights and make sure they are not complicit in human rights abuses. The Principles further complement the responsibilities of business in respecting human rights as provided for in Article 20 of the Kenyan Constitution. Lawyers from the global law firms Clifford Chance LLP and Linklaters LLP facilitated the session on what respect for human rights means for corporate planning and strategising and the responsibilities and opportunities arising when a business commits to implementing the UN Guiding Principles on Business and Human Rights. (UNGPs). Pillar III: Access to Remedy - The need for state and non-state based, judicial and non-judicial remedies to ensure that rights and obligations are matched to appropriate and effective remedies when breached. The facilitators further elaborated on the 3rd pillar on Access to Remedy where a range of actions including apologies, restitution, rehabilitation, financial or non-financial compensation and punitive sanctions (whether criminal or administrative, such as fines), as well as the prevention of harm through, for example, injunctions or guarantees of non-repetition, can be taken to counteract or make good any human rights harms that have occurred. Discussions also focused on international trends in the field of business and human rights including the role of states in regulating business conduct through imposing reporting requirements. Participants were also sensitized on the emergence of issue specific international laws such as the Modern slavery Act and those touching on child labour that African companies should pay attention to. The meeting concluded with Global Compact member companies such as Safaricom, Nestle, Bridge International, Krystalline Salt, Unilever, Kenya Commercial Bank, Cityscape trends, Panini Corner, Lavington security sharing their experience and challenges in respecting human rights.